Is there a hard case for Pyramid? What do you use to transport your Pyramid? I’ve been using my Maschine MK1 case but it doesnt fit very well. Wondering if a case is in the works or if any other users have a solution for transportation. I’m wondering the same thing! I’d even be grateful for a Decksaver for the Pyramid. Just something to protect those knobs and screen while it’s in a backpack, without adding much bulk or weight. I’ve seen several soft cases for the Push that could technically hold the Pyramid, but they’re bigger than necessary. Maschine is probably a slightly better fit, but still not perfect. Come on Squarp, this is a real opportunity to generate more revenue! Accessories are high profit margin, especially low-tech accessories like cases! I bet Decksaver even makes those kind of deals painless and simple! This post probably isn’t that helpful, but this case came from Costco a couple years ago and fits perfectly. Unfortunately there is no way of identifying it. Wow that thing is massive, kinda looks like a Pelican or Seahorse case. Do you put any other gear in there with it, or just the Pyramid and its cables? For my use-case, and since the Pyramid inherently requires additional equipment to be able to produce any sound, I need something much more low profile to put the Pyramid in, so I could then put it in a larger case or bag with other gear for transport without worrying that the other gear would pop off a knob or crack its screen. But OP did ask about hard cases people use for transporting their pyramid, and this certainly fits that bill! I have been exploring the idea of a case similar to the one you show to house a small Eurorack rig though, which would be one of the sound sources that Pyramid would sequence. Ha! It may be the camera angle that makes it look larger than it actually is. That open area fits the Pyramid perfectly and that little extra space can be used for the power cord and some CV cables. While it’s not something you can throw in a backpack with other gear too easily, it is a rather compact case for it’s style. I’m curious what people are using. 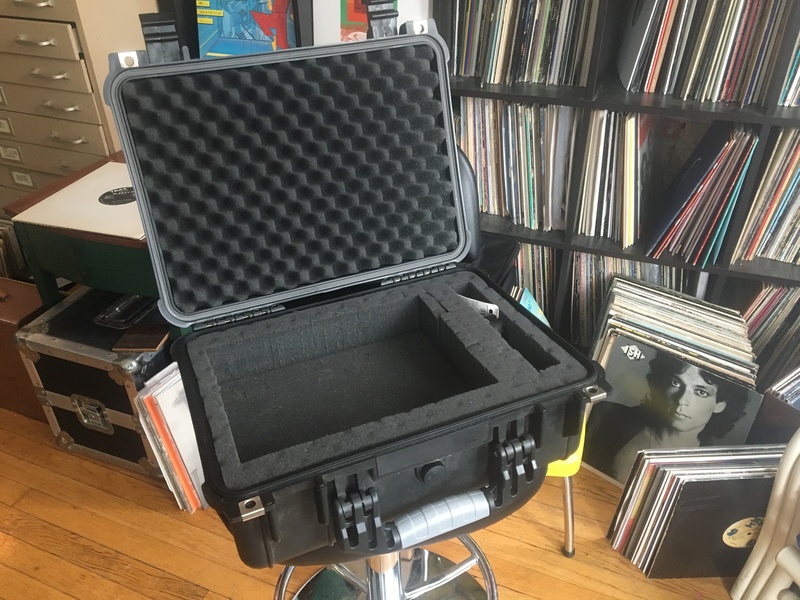 I actually had a fairly long conversation with Greg from Analog Cases (@analogcases on Instagram) about producing a hard case for the Pyramid. He was very into the idea, and even had me take a variety of measurements of my Pyramid so the interior foam could be cut to fit it snugly. I even sent him a number of close-up pictures of the unit next to measuring tapes, etc, to help validate the measurements. Last I heard, he was finishing a prototype so hopefully they’ll be available for purchase before long. The cases are essentially a standard slim metal briefcase-style housing with inner foam that is cut to exactly fit the hardware. You can see pictures of the same type of case used for a variety of drum machines and desktop synth boxes on their Instagram page. These are similar to pelican cases, although it’s prob cheaper. I would still want something to protect knobs, I have a digitakt and as tanky as the unit feels, I had a bad experience with the knobs on a model I had initially.